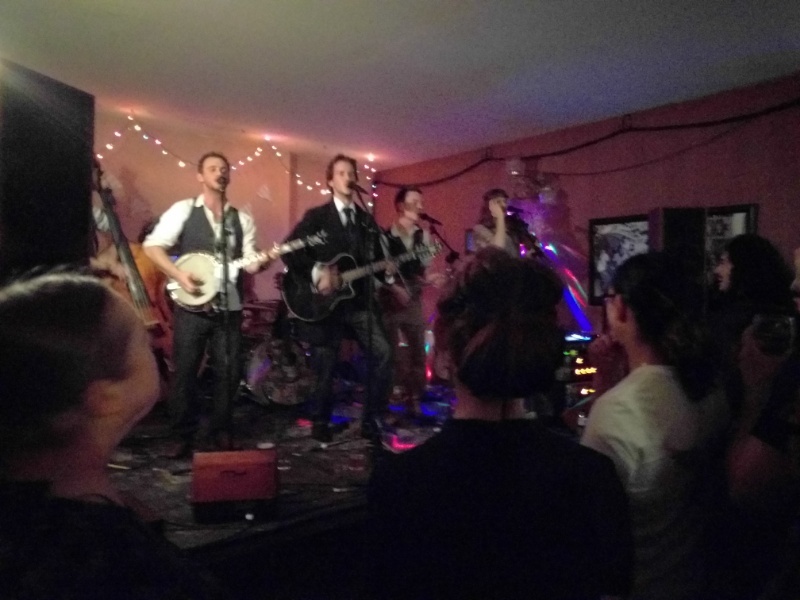 Isembard’s Wheel sit between modern indie folk and more traditional folk fare that should properly interest the industry both as a great live band and one with crossover appeal. Relatively speaking Isembard’s Wheel are fairly new to the scene, though they have appeared in a few prestigious places (Warwick Folk Festival), and have had a mention on BBC Introducing too. Tonight we see them for their album launch of “Common Ground.” It is a rather joyous affair with fire dancers, some warm-up acts and some great beer on tap. There is definitely something here with this band. On listening I would say that their music could be considered a kind of keystone of folk music. It is like an indie folk band in terms of arrangement and instruments but there is a keen, natural eye that looks to traditional folk for songwriting and themes which goes beyond most indie folk artists; and this for me is pretty exciting stuff. Many an hour can be spent debating what “folk” is and lamenting on the state of live music or volume of young audiences but truly a band like Isembard’s Wheel (in my mind at least) has the potential to be the bridge or even reception room to the vast, varied and interesting genre of folk music. Before the group takes the stage we are treated to some support acts. Acoustic singer/songwriter Jordan Wrigley took the stage first. Jordan Wrigley, from Wakefield is a student of Law at Sheffield Hallam. He has performed during SHUfest (a celebration of talent at the University) and a few other places too. There are no dusty tomes to be seen or any interrogation of witnesses, for his knowledge of performance is up for judgement on this night. Wrigley has an enthusiasm and also brings a quiet sensibility to his set and character. A good and practised voice, his cover of “The Banjolin Song” from Mumford and Sons benefits from being a more stripped down version of the song. I prefer it to the hit number which is more buried in layers of reverb and production and in hindsight too many expected conventions. Wrigley’s effort draws in more attention to the lyrics and celebrates the acoustic form as much as a bear celebrates honey. He also plays Paulo Nutini’s “These Streets” too laying down a consistently positive attitude throughout the course of the songs. All this being said, in the best possible way, his own songs overshadow the covers and hint at a deft hand for folk writing; for example “The Charge”, a song heavily influenced by the Charge of the Light Brigade. Quite persistent in how it grabs you, there are some interesting storytelling elements within and of the soldiers’ lived experience. With a little more instrumentation and arrangement that could bring the deeper boom and impending doom of this subject matter further to the listener’s consciousness, the song’s could shine even more and would not be out of place on a veteran folk artist’s album. He also shares an original song based on Wuthering Heights, and some more familiarity with a bit of Springsteen. It is good to see consummate ukelele play and a positive reception to this set from the audience. In sum a refreshing amount of variety, a good opening and an artist to keep an eye on. The second warmup act is The Idolins. Somewhere between the Cranberries and The Corrs the group occupy a scene within pop-folk with a seasoning of rock. Coming to the stage with candor and some Nottingham charm thrown in, The Idolins have got a long reach and appeal to listeners who enjoy different genres; their talents have not gone unnoticed by BBC Radio 6 for example. They have a lineup that includes original member Karen Smalley-Turner (vocalist, songwriter, guitar), Nick Scott (guitar, harmony), Mark Rice (percussionist), Dukes (bassist) and Hannah (cello). “The Idolins” have a sweet sound, the voice is not syrupy in-your-face sweetness but rather an ambient sweetness; like the marshmellows in a Rocky Road. They previewed “Refuge” adding some banjo to this as yet unrecorded number. Rolling in bass there could be some comparisons made with this song to Natalie Imbruglia, though with a more social-issues subject matter, it is quite thoughtful and enchanting. A favourite for myself is their new single, “Seasons.” More of a ballad, the fiddle sounds especially good and the lyrics tangle themelves around the concept of seasons of the relationship’s temperment and life. Nicely worded and like a quiet blustery day it captures the idea and gently spins a story of colour, intensity and sadness; worth an exploration. There areplenty of other tracks to be enjoyed too including the self-professed “Skunk Anansie-like” track “Safety Net” with it’s heavier rock and “Nothing Missing” where slight world influences with great rhymes and an anthem to sing along to. A lot to like on the way to Isembard’s Wheel, check out the Idolins website here with details of purchasing “Seasons”, their most recent single. 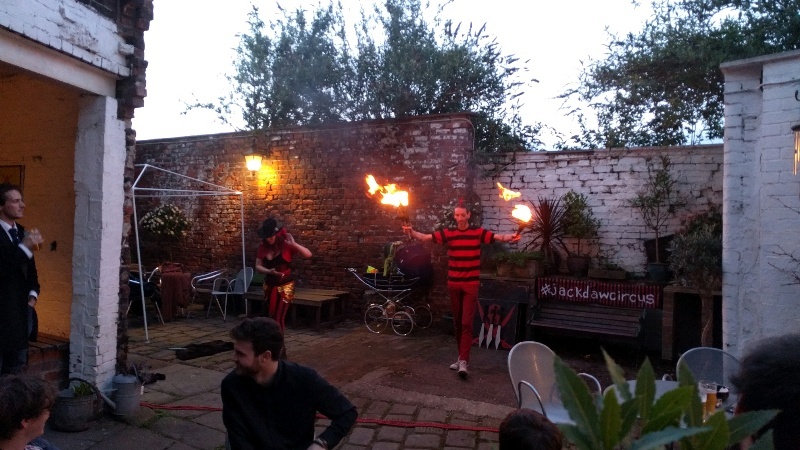 Before we get there though I would like to give some applause for “Jackdaw Circus” who provided some fire-based entertainment on the evening. I don’t think I’d seen a firewhip before, the closest I’ve ever come to it is the energy whip in the 80’s He-Man film (I was young and my taste went astray). It was great, I’ve seen a few circus acts in the past, but these guys were something else; you can tell that they have performed in Edinburgh Fringe in the past. 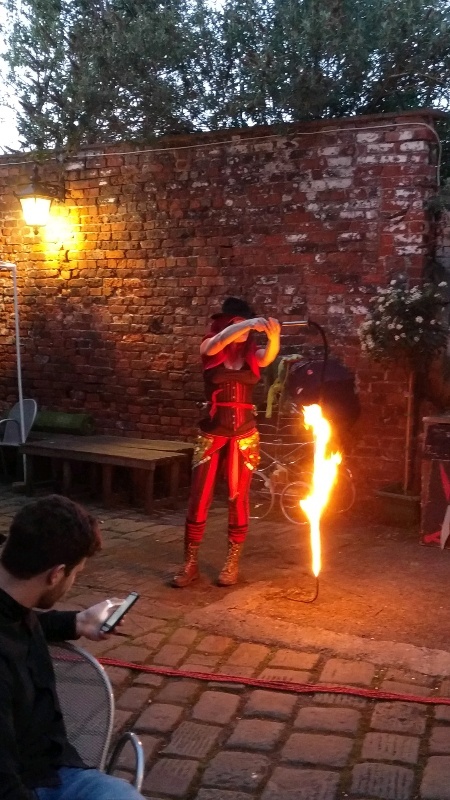 Funny and political and really practised, the duo of this fire-taming group entertained between artists and as performers some of the friendliest people you can meet. Their skit around different Countries was particularly good. If anyone reading needs to book some entertainment; you can’t go wrong with these contemporary Denis the Menace, fire bard types. Check out their site here. Comprising Alexander Isembard, Edward Young, Toby Morris, Rebekah Foard, Joss Mann-Hazell we get a great combination of lyrics, guitar, banjo, double bass, and fiddle that shakes the Shakespeare, sparks the light fittings and generally throws both feet forward into the world of folk and live performance. “Rauccous” is not the right word, but there is a lot of energy here and for a debut album from a relatively new group there is a fearless attempt to try and cram in a number of genres, and like a pirate who has ransacked the sinking ship, the gamble pays off. The positive qualities of young musicians is sometimes attributed to a lack of restraint over genre and previous traditional material, I would say here that “Common Ground” doesn’t fit this mold. It instead is a large showcase of musical forms and niches that are performed very well within their own genres and then brought together here. It is quite sharp about how the group does it, it is not an album that feels like it stumbles at any point and whilst reverent of different works, it never slows to catch it’s breath. For example they do a more than serviceable cover of “Adieu, Sweet, Lovely Nancy” with an Americana influence and layers of strings making it more of an anthem than you might imagine. As it progresses it goes a bit mad and just after the middle we arrive at Sydney Carter’s “Lord of the Dance”. It won’t be to everyone’s tastes but it bursts out and gets the crowd going, for younger readers there is actually a bit of Green Day going on in this performance (yes, I am aware they aren’t a new band ha ha). The good thing you feel from their performance and the disc is that these are not token references, there is a love for what has come before. “Ask the Time Away” is similarly nimble number leaving with little time to gasp with a rewarding and almost pop voice awash with like the light flashes from artist’s palette, “I could make the finest work of art, it would soon fade.” More dancing is inbound with “Turner’s Bones” which has the youthful energy of indie folk of kicking a positive beat to life with it’s characteristic big drum, it’s a song that enjoys itself it reminds of that first hint of sun in the Spring that laps at your door. They are certainly adding something to the folk genre. Their sound has a lightness of touch in lyrics that reminds me of the rather prominent group at the moment “Ninebarrow” with the dwelling on the influence of the rocks, the birds and the green landscape that gives rise to inspiration and celebration. “Isembard’s Wheel” take introspective lyrics and take them down on a whitewater raft. Their sound seems very much to be situated in the Sheffield with influences from the Peaks and their songs have a naturalistic feel to them like the Green Man himself is roaming the Damflask reservoir or pottering across rocky outcrops at Mam Tor. As a local there are a lot of different landmarks and energy of the land that they have in their collective musical aura. In the flesh they are an enthusiastic group who had a large mixed-age audience. There is a lot of crossover appeal with their songs concerning all matter of subjects that are held together by a coursing tide of nature and history in it’s discourse. Their set is quite loud as a vehicle for their creative energies, the crowd are equally enthusiastic and engaging; a quiet set of folk ballads this is not. But then not everybody does that, and the folk industry should be happy indeed with a band such as this which has faceted a musical sculpture which is not just indie-folk but has a place in myth-making and traditional folk music too. 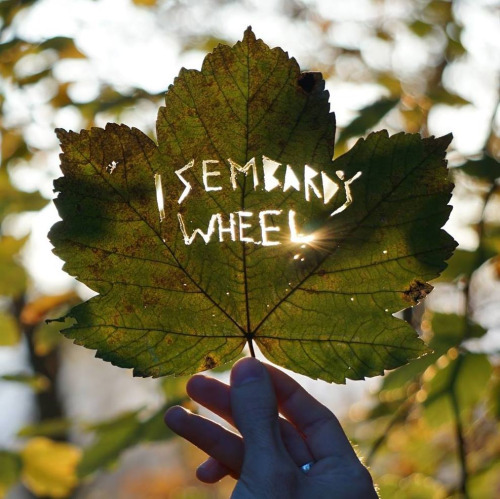 Quite fearless with musicianship that combines energy and sensitivity, Isembard’s Wheel should be on your radar.